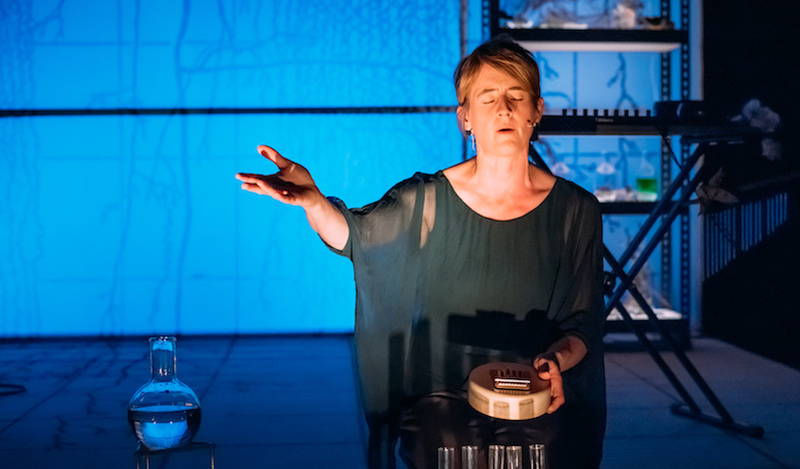 Karine Polwart’s one-woman show is an intimate, tender thing to behold. A tapestry of folk concert, autobiography, fireside anecdote and feminist lecture, Polwart pulls together disparate mediums and narratives to create something akin to the original Highland Ceilidh – not only song and dance, but also community meeting and personal storytelling. There are several stories – some folk tale, some personal, some anecdotal – that make up the overarching narrative of ‘Wind Resistance’; the migration of geese; the history of Fala Moor, near the artist’s home in Midlothian; the ultimately tragic love story of her neighbour’s parents; Polwart’s own life; and multiple threads of Gaelic folk tales and myths. The simple set consist of the layout of an office, a few guitars to accompany Polwart’s singing, and a striking, monochrome backdrop – a design of wild birds and long grasses by J.E. Weaver from 1918. With the feel of a shadow-puppet set, this gives the sense of something between a close conversation and a traveling village theatre. Polwart herself is an incredibly dynamic performer – her haunting voice is perfectly suited to the melancholic folk classics she weaves through her narrative, her bare script is infused with a deep knowledge of the natural word and a gently, consistently poetic turn of phrase. One of the most touching threads of Polwart’s storytelling is a history of women healers, particularly the evolution of midwifery. First discussing the archaeological discovery of a convent hospital that once stood on her beloved moor, Polwart sits front of stage, carefully mixing the ingredients of old herbal medicines: hemlock, juniper, larkspur. Playing the role of both herself and an omniscient narrator, Polwart occupies the space of the women healers she speaks with such love for; part wise woman, part witch. This is the crux of the play; the tireless, unacknowledged work of women in both early and modern medicine, and the danger, power and magic of childbirth. Polwart’s deep knowledge of and passion for the natural world is deeply evocative, but it is her testament to forgotten women that makes this a profoundly moving piece of theatre.